Home / Blog / Industries / Healthcare Industry / What is Real World Evidence and why does it matter? Real World Evidence (AKA “Real World Data”) is a worldwide trend in Health and Life Sciences. New kinds of data, such as electronic health records and data mining tools are now available and allow us to extract information and knowledge. We can detect medical treatment costs, treatment efficiency (cost, benefits, and risks), references to drugs, side effects, or long-term results. Text analytics is an essential component of this area of knowledge. Austerity measures and related price cuts have put unprecedented pressure on the pharmaceutical industry. Manufacturers are being asked to provide information related not only to safety, appropriate use, and effectiveness but also to clinical and economic value. Although randomized clinical trials (RCTs) remain the gold standard of clinical tests, factors such as varying responses to a drug in real life, not completing the course of prescriptions, or using unauthorized medication before or during the trial limit the generalizability of results from randomized clinical trials. Real World Evidence (also called “Real World Data”) has been fueled by new data technologies that leverage the valuable information contained in electronic medical records and personal information repositories. This post is a review of those Real World Evidence sources and of the benefits that Pharmaceutical and Life Science companies can derive from them. In the sector, we often use the terms “Real World Data” and “Real World Evidence” almost indistinctly, but they are not exact synonym. “Data” refers to factual information, whereas “evidence” implies that the organization will use the information to make a conclusion or judgment. Data is raw material. For the FDA, whereas Real World Data is data collected from sources outside of traditional clinical trials, Real World Evidence is the evidence derived from aggregating and analyzing RWD elements. As a result, between data and evidence, we put the analytical processes into place that allow us to convert data into evidence. Years before the term “Real World Data” was coined, results from observational data supported the use of beta-blockers in patients who suffer from heart attacks. In the 1990s, the Cooperative Cardiovascular Project examined more than 200,000 patients who had suffered a heart attack (myocardial infarction). The project found substantial reductions in mortality among patients who received beta blockers. The Cooperative Cardiovascular Project significantly bolstered previous evidence from randomized clinical trials and helped make the use of beta blockers in heart patients a standard practice. Benefits of Real World Data for the pharmaceutical industry and life sciences organizations. Investing in studies that demonstrate the real value of drugs can have many benefits for the pharmaceutical industry. 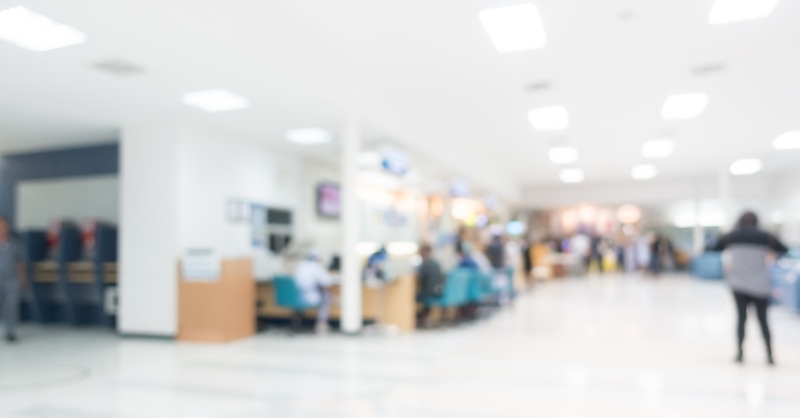 Real World Data is the right tool to streamline the use of resources, to listen to the authentic voice of patients, and to facilitate collaboration between the pharmaceutical industry and the public sector. In practice, the funding of Real World Data projects comes primarily from pharmaceutical companies. Government funding is significantly lower. Decision makers in the health sector look for more information in the “real world” to evaluate the results to base their decisions on. The pharmaceutical industry is forced to provide evidence related not only to security, proper use, and effectiveness but also to the clinical and economic value of their medication. That is, to accept the distribution of a particular drug, the purchasing managers require evidence of cost-effectiveness, which is often accompanied by evidence of organizational, social, and ethical implications of the contribution of the product. Real World Data allows you to compare many alternative research or clinical strategies (e.g. older vs. newer drugs) to inform of optimal treatment options beyond the use of placebo as a control. Most patients treated in health services are not eligible for randomized clinical trials because they are at an advanced age or experience comorbidities. As a result, the information derived from their attention is not recorded. Thanks to Real World Data we have access to clinical outcomes in a diverse population that reflects the range and distribution of patients observed in clinical practice. Estimates of the evolving risk–benefit profile of a new intervention, including long-term (and rare) clinical benefits and harms. In a 2009 study using Real World Data, they compared the effects of early and delayed treatment with budesonide, 13 years after beginning to use it. 5. Voice of the patient. Patients reported outcomes For pharmaceutical and life sciences companies, it is vital to listen and understand the feedback that their current and potential customers express through all kinds of channels and touchpoints. That is why brands are extending their Voice of the Patient initiatives to a new territory of unsolicited and unstructured content: comments on surveys, call center verbatims, Twitter, etc. MeaningCloud (meaningcloud.com) is a semantic platform to analyze the feedback from patients at any touchpoint (email, call center, surveys, social media, etc.). It manages their experience at all points of contact with the company. TrendMiner (http://www.trendminer-project.eu) is a drug safety tool developed by Daedalus (now MeaningCloud) along with the research team LABDA of Carlos III University in Madrid. It analyzes discussions in social networks and forums about drugs, symptoms, conditions, and diseases to extract valuable insights. Information on how a product is dosed and applied in clinical practice and on levels of compliance and adherence to therapy. Test type: The results of many RCTs are not generalizable to a larger population, while a rigorous observational study can be useful in certain situations when possible biases are adequately addressed. 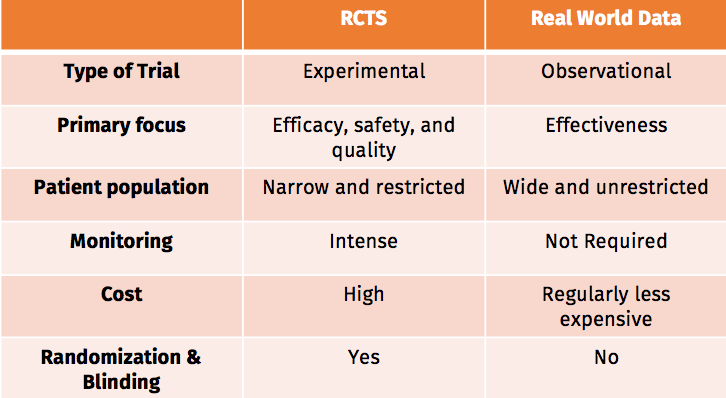 Primary focus: RCTs of medicines focus on efficacy, safety, and quality as endpoints. RW studies consider a more contextualized parameter, which may be described as ‘effectiveness’. Patient Population: While RCTs illustrate the efficacy, safety, and quality of an intervention, their general exclusion criteria may produce studies in only a narrow segment of the population , leading to results with limited external validity. Cost: Large RCTs can cost millions. RW data collection requires a much lower level of funding.